This movie is a very welcome one about a piece of history that not a whole lot of people are familiar. Well, at least not into great detail, not in the least because some things were kept under the wraps, for the longest time. It's a pretty insightful movie, that never gets too heavy with anything, which at the same time is both positive and negative thing. It's not really a movie in the classic sense. It's what, I always like to call, a telling of events. Almost more like a documentary, that gives you the facts, in a very straightforward and almost cold kind of fashion, without ever featuring much of a buildup or some true tension and drama. I see this both as a good and bad thing about this movie. It's good as a movie to learn from but quite weak as one to get truly taken in with. I however do feel that this is a sort of OK for this particular movie. After all, it's one that's made for the National Geographic Channel, so it has to be educative and it's about events that we already all know the outcome of, so what's the point of trying to create any tension and drama in the progress of telling its story? That's simply not the point. It's not a biopic or a big drama that's aiming for any Oscars. It's a movie that's there to educate you about a certain event(s) in history. And I'll be honest, I rather watch a movie like this than a documentary about the very same subject. It's not that I hate watching documentaries but the idea of having to set through something that's narrated, filled with archive footage and a bunch of interviews with people is something that I can't get myself to watch and a reason why I really don't ever watch that many documentary movies to begin with. So for me personally these type of movies are perfect and I could imaging that it's perfect for big groups of other people as well, such as for instance students. I would rather want to learn from a movie like this than a text book or an 2 hour long documentary, if I still were a student. Its style also ensures that it's not always the best movie to watch though. Like I said, it feels a bit like a cold and distant movie, which is not the most pleasant thing to have to sit through but also the directing itself feels too lacking at parts. I can't really put my finger on it. The movie feels too fast but at the same time also too slow. Perhaps it's because the movie its story isn't giving you much information, besides from the absolute necessities. The fast pace tells you that the movie is giving you a lot of information but the slow progress of the story actually provides you the opposite. It feels conflicting to watch but this is the case with basically every made for TV movie, that doesn't have to budget or other capabilities to do a whole lot more than just telling you a 'simple' story. Thing that still really puts this movie above the average TV movie is the acting. Not only do the actors look pretty darn close to the people they are portraying, they also play their roles very well and convincingly. 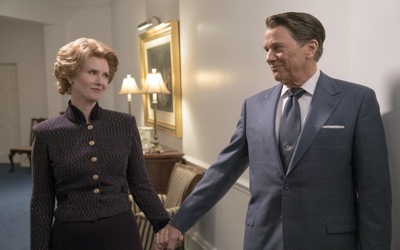 Tim Matheson and Cynthia Nixon truly carry- and make this movie, as Ronald and Nancy Reagan. It was still odd though how this movie almost idolized its main protagonist. Ronald Reagan wasn't only portrayed as an ultimate good guy but even as almost an hero as well. It felt forced and besides unrealistic but I guess that's just how Americans look up to their presidents and how they want to see them portrayed as. Not so great as a movie but pretty good as an interesting and insightful telling of events about a part of American history.